The La Grande Classique is a conservative collection from the Swiss luxury manufacturer Longines. Especially thin quartz watches for both men and women dominate the series, although versions with mechanical calibers are also available. Longines' La Grande Classique collection is characterized by a simple, timeless look. Most models have streamlined designs with nothing more than the bare essentials: two hands for telling the time. Some versions feature a seconds hand and a date display, but overall they remain an exception in this series. It is also possible to find La Grande Classique timepieces with a tonneau case, but most have a round, thin, stainless steel case. A unique and distinctive feature of the La Grande Classique timepieces is their lack of the traditional four lugs. Instead, they have two small bridges, one at 12 o'clock and one at six o'clock, which are attached to the round case. Some older models feature standard lugs, but current La Grand Classique timepieces exclusively feature bridges. 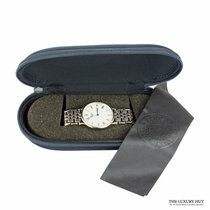 Longines primarily uses quartz movements in this series. Smaller timepieces are powered by the caliber L209, while the larger versions use the L420. Both are based on movements from ETA SA Manufacture Horlogère Suisse. ETA, like Longines, is a member of the Swatch Group, and provides movements to countless renowned watch manufacturers. ETA also supplies the mechanical movement used in a few La Grande Classique models. Their A20.L01 serves as a base caliber for Longines' L591 movement. It vibrates at 28,800 alternations an hour and has a 40-hour power reserve. 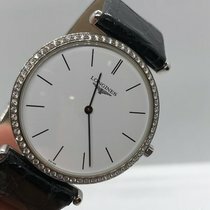 Which La Grande Classique should I buy? Are you looking for an affordable dress watch made by one of the oldest Swiss brands? La Grande Classique timepieces have a traditional, elegant design, and thanks to their quartz calibers, they're affordable, precise timepieces as well. Some variants of the La Grande Classique are fitting for both men and women. The version with reference number L4.755.4.71.2, powered by an L420 quartz movement, has a diameter of 36 mm, making it well suited for thinner wrists. A silver flinqué dial gives this stainless steel version with a black alligator leather strap a conservative look, emphasized by the use of Roman numerals as hour indices. The steel version costs around 800 euros, but if you're interested in the PVD rose gold coated version, then you should look for the timepiece with reference number L4.755.1.91.2. There is an alternative available with a more modern look and streamlined feel. Its silver dial features thin stick hour indices and two slim baton hands. This Grande Classique (L4.908.4.72.2) distinguishes itself from its siblings by its mechanical movement. 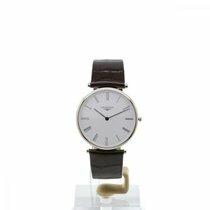 Its 36-mm stainless steel case is a modest size, making it suitable for both men and women. This timepiece is also a bit more expensive on account of its automatic movement, costing around 1,100 euros new. 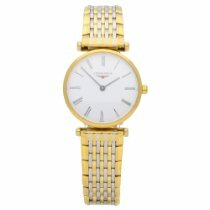 The most expensive Longines La Grande Classique models are targeted towards women; their diamond-set bezels and diamond hour indices are to thank for their price tags. Up to 100 diamonds grace the bezel and 12 diamonds serve as hour markers on many models. Longines offers different variants of these watches with black, dark blue, and mother-of-pearl dials. The stainless steel versions cost around 4,000 euros. Occasionally, you'll find dealers offering 18-karat yellow gold variants with a matching yellow gold bracelet. When paired with a diamond-set bezel (L4.691.7.11.6), the price can reach up to over 10,000 euros. 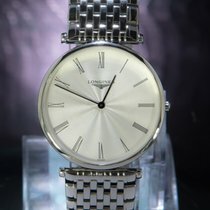 The Longines La Grande Classique is waterproof to 30 m (3 bar), perfect for everyday wear. However, you should not wear the watch while swimming. Sapphire glass protects the dial displays; the material is significantly more scratch-resistant than traditional mineral glass. In terms of production numbers, Longines, along with Tissot, are the top Swiss manufacturers. They produce a significant amount of quartz watches. The company was founded in 1832, making it one of the oldest registered and active brands in the world.